This month should have been devoted to games begining with the letter "I". It proved however extremly difficult to find top quality public domain or shareware games which would fall in this category. I had almost given up when I stumbled upon Insectoids 2 a great, fun packed shoot em up. The game reminds me of the old arcade shoot em ups which were available in the 1980s. This is classic shoot em up at its best. Aliens enter the screen from left to right before joining up into a block for you to blast away at. There are power ups available to make it a bit easier to progress. The graphics are basic, the background is the classic black with white stars and the enemy ships are simple in design but this really doesn't matter as the game play is great. The controls are responsive, the collision routines are spot on and you never feel cheated when you die. One frustration is that you can only move the ship from left to right without the option to move up or down the screen. This does however benefit the difficulty of the game making it harder to avoid bullets and make the player think carefully about where they move their ship. Overall this is a classic shoot em up which has all the features you would expect and plays like a dream. If you have never played it then definately give it a go. I don't remember playing Jouster 1 or Jouster 2 but I do remember playing Joust on the BBC Micro and this game seems to be an accurate conversion of that. For those of you who haven't played Joust let me quickly update you on the aim of the game. The idea is simple, all you have to do is move your knight who is riding a dragon like creature across the sky and knock off the other flying knights. If you manage to do this successfully then the knights will drop an egg like object which you need to pick up. Once you have successfully knocked all the enemy knights off their steads you progress to the next level. As you can probably guess the game play is repetitive but yet strangley enjoyable. I am not sure if it is a fault with the collision routine of this version but it seems quite easy to dislodge the enemy knights by landing on their heads from above. I don't remember this being possible on the BBC Micro version and it does make the game very easy to progress. Overall if you enjoyed the 8 Bit version then you will probably enjoy this version. It is unlikely however that it would be a regular play but a nice distraction for a few minutes. The game can be downloaded from Aminet. Download Game: This game can be downloaded from Aminet. This game is similar to an idea I presented to the Amiga Power design a game competition. My entry was called Blob and involved moving a "Blob" across a scrolling level, landing on different tiles which had different consequences for the player whilst also avoiding enemies which would fire at you. On reflection this would have probably proved too manic to be playable. 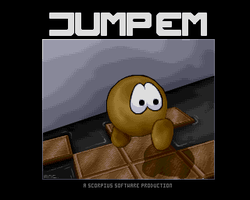 Jump Em thankfully takes a more managable approach to game play. It keeps the idea of landing on different tiles but makes it more of a puzzle game with the game fixed to a single static screen. The player has to plan a safe route from the starting tile to the end tile ensuring that each tile is landed on a sufficient number of times to ensure that it disappears. The challenge is two fold. Firstly there is a time limit for each level which means that you can't spend ages planning your route and have to make quick decisions on the route you will take. Secondly the tiles can only be landed on a certain number of times. To complete the level all tiles have to be landed on the required number to make them disappear. Leaving any tiles still standing will result in the level being uncompleted. Trust me, this is a not as easy as it sounds but not too difficult to make you give up without having a second, third or fourth attempt. The game was written by Andrew Cashmore and appears to follow the great tradition of bedroom coders that existed during the Amiga era with Andrew being involved in everything from programming to producing the graphics and sound. The game was released as a Licenceware under 5th Dimension. There was a playable demo of the game made available for public domain release and this is the version of the game that I have played endlessly over the previous week. The demo version of this game can be downloaded from Aminet. My mission now is to locate the full version of the game which contains all the levels. In the coming days I will be contacting Andrew directly to see if he still has the full version of the game and whether he is happy for us to distribute it via this website. I will also ask if he is prepared to complete an interview for the website too. Fingers crossed on both fronts as this has become one of my favourite Amiga games and I am sure that many of our readers will be equally eager to pit their wits against the full version.